I just joined the #BagBrigade at The Green Life Online and pledged to use reusable bags instead of plastic bags. 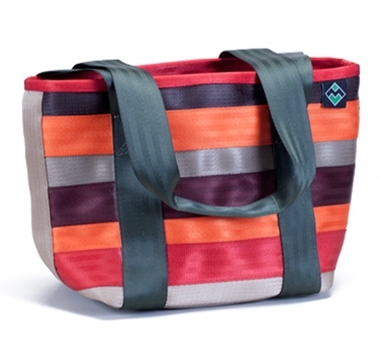 We love these Maggie Bags made from Recycled Seatbelts. They come in a range of single colours, or multi-colours like the Autumn Leaves bag pictured here. These bags are made to last with four nickel plated feet on the bottom and internal zip pockets for your purse, keys or cell phone. These Rebagz Cinchy Tote Bags are made from recycled rice sacks. 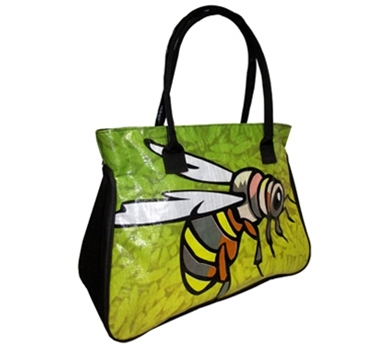 The one pictured here is called Honeybee, and there are other fresh and funky styles available. These Cinchy Tote Bags are not only eco-friendly and stylish but they are human-friendly too because they are made under fair labour conditions. Makes a great shopping bag, handbag or even a briefcase! Finally, the Flip & Tumble Reusable Shopping Bag. Gorgeously designed in loads of colour choices. Reusable shopping bags that folds up into a tiny pouch when not in use, it’s so easy to take it along when you go shopping. This bag can hold 25 pounds and has a comfy fit felt shoulder pad. Click here to join me and take the pledge to make plastic bags history! Looks brilliant, thanks for sharing. I love your article. I wrote a similar one a while back featuring designer who made handbags using recycled materials. I’d like to share some more great handbag designers with you. They are: Ecoist, Matt & Nat, Kim White, and Passchal. *Ecoist’s handbags are 100 percent handmade from recycled candy wrappers, food packaging, soda labels, newspapers, subway maps, and other materials headed for the trash. Instead of throwing out misprinted and obsolete packaging, and having them end up in landfills, companies give them to Ecoist, which turns them into handbags. Ecoist’s styles currently cater to women’s needs for evening and daywear. The styles range from very glitzy, funky, and quirky to classic and sophisticated glamour. *Matt and Nat collections are devoted to the vegan lifestyle. The handbag collections are made from combinations of recycled bottles, vegan leather (pleather) materials, and metallics. All of the handbags contain at least one recycled material, and on average about 21 plastic bottles are used to make the lining of each bag, says the company. Some of the great things about Matt and Nat’s designs are that they’ve created a wide range of style options and utility functions for both the men’s and women’s collections. *Kim White’s handbags made from out-of circulation unused fabrics originally intended for upholstering vehicle seats. The handbags are made from vintage fabric stock primarily from the 1970s and 1980s. The great thing about these fabrics is that they look good and are very durable, since the materials were originally intended to be used as vehicle upholstery, and what other kind of material is capable resisting more wear and tear. The company also recently got a hold of a vintage airline seat fabric. It was originally intended for use in a United Airlines plane. Kim White’s style is primarily vintage daywear that ranges from casual to dressy. Some of the pieces can be used for eveningwear depending on where you’re going. *Passchal uses discarded tractor tire inner tubes and converts them into high-end luxury handbags. The company also incorporates leather trim and sides to its handbags that are vegetable-dyed, vegetable-tanned, and chrome-free. Passchal’s handbags are primarily geared toward women with styles ranging from elegant eveningwear to playful causal daywear to utilitarian-wear, such as briefcases, travel bags, and totes. I hope this is a useful addition to your great content!